In general, Italian food is better than Italian metal, but there are a few exceptions, and Ensoph are one of them. 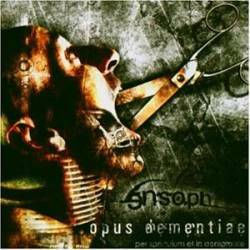 Their second album Opus Dementiae could be seen as another gothic album, but all songs are enriched by other styles like avantgarde, experimental, electronica, industrial and black metal so that the entire work is quite unorthodox and not always easy to be listened to. But that's exactly the spicy part of the record, you never know what to except next. For instance, doomish Type O Negative parts are followed by morbid early Celtic Frost like sounds. That's just one of many examples to underline Ensoph's very liberal and unique conception of songwriting. They are faster than Dimmu Borgir, more theatric than Notre Dame and more original than most black or gothic metal acts. The album is closed by an interesting remix of Sophie's Fall by German dark wave masters Das Ich. If you're open-minded enough to like sick and disturbed orchestrated parts filled up with a huge range of vocal deliriums, this epic work is exactly the right thing for you. Opus Dementiae can be really called innovative metal. It's entertaining, frightening, bizarre, beautiful, aggressive, brutal, chaotic,... Ensoph are the Mr. Bungle of the metal world.